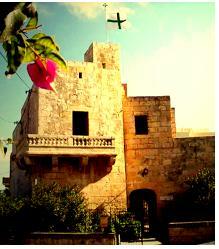 Torre Lanzun located in the Mensija suburb at San Gwann, Malta was inaugurated by Grandmaster H.R.H. Don Francesco de Borbón y de Borbón as the official headquarters of the Order of St. Lazarus on the 12th May 1973. Torre Lanzun was originally a 15th century farmhouse that by the 17th century had transferred ownership to Wenzu Lanzun from Cittá Vittorious, thus accounting for its present name. Wenzu Lanzun transferred residence to the farmhouse during the 1676 plague epidemic in an attempt towards avoiding the dreaded infection—in a way placing himself and his family in virtual isolation and quarantine. The San Gwann region was in the 17th century very poorly inhabited; though the locality had long housed a number of wayside chapels. Close to Torre Lanzun stands the cavechapel dedicated to San Leonardo. Known today as the Chapel of the Annunciation [Lunziata Chapel], this cave-chapel is associated with a popular medieval legend. The locality during this period fell under the jurisdiction of the Birkirkara Parish. Other chapels recorded in the vicinity of the Gharghar [sive` Arar] region during the Medieval period included the parochial church of St. Helena, situated possibly close to the Ta’ Cieda Tower. Abandoned during the 14th century, the remains of this church were still extant in 1575 when the Apostolic Visitor Mgr Petrus Dusina wrote his report. Dusina wrote “Sanctae Helenae – Visitavit aliam Ecclesiam ruralem sub vocabulo Sanctae Helenae constructam in pertinentia Bircalcariae in contrata nuncupata Arar, quae alias dicitur fuisse parrochialis Ecclesia, habet altare, caret rectore, introitibus, portis ligneis, et omnibus alijs necessarijs ex devotione Michael Borgiu in eadem die festivitatis celebrare facit missam tantum, non celebretur amplius, nisi postquam fuerint factae portae ligneae.” Other churches located in the Gharghar region mentioned by Dusina were those dedicated to Santa Margarita, Sant Andrea, San Bartholomew and of course the cave-chapel of San Leonardo. In 1713, structural modifications were made to the edifice thus enlarging and strengthening to serve as a fortified building to serve as a haven for local inhabitants during pirate raids. It also served as a hunting station for the Grandmaster of the order of St. John. During World War II, it was used as an observation post for enemy planes, and was rather severely damaged during enemy action. In 1971, the building was purchased by LtCol. Robert Gayre of Gayre and Nigg, Laird of Lochore who then was serving as Grand Commander and Grand Almoner of the Order. The buildings were then passed on to the Order for use as its Administrative Headquarters—the Grand Chancery. An effort was made to restore the buildings and carry out improvements. The work was undertaken under the direct supervision of architect and civil engineer Chev. Maurice Captur, a member of the Priory of Malta. Notary Dr. J.R. Grech gratuitously gave his professional services. By the beginning of 2003, all restoration work had been completed. Then began the fitting and furnishing of the Grand Chancery carried out through the generosity of the various members of the Order. The generosity of the members of the Priory of Malta was not absent. In monetary terms, the various Maltese members donated a total of LM 200 for the endeavour [the membership of the Priory in 1971 numbered 25 individuals]. In addition, other members donated various specific items to embellish the building. On the 12th May 1973, the building was formally passed over to the Order and started functioning as the Grand Chancery, the Grand Chancellor then being Chev. J. Amato Gauci. The transfer of the Grand Chancery to Malta gave the opportunity for many Maltese members of the order to involve themselves in the general international management of the Order often occupying foremost administrative positions. In the meantime, the Hereditary Commandery of Lochore in Malta established by Lt. Colonel Robert Gayre in 1967 established its headquarters in Torri Lanzun. Many of the members of this Commandery were of British nationality and numbered a total of nine resident members in 1983. This commandery was renamed the Commandery of the Castello in 1986. In the wake of the 1995 split of the British contingent from the Paris Obedience to form the United Grand Priories of the Hospital Order of St Lazarus and the fear that the British members of the Malta Obedience will follow suit and appropriate Torre Lanzun, the then acting Grand Chancellor—Chev. Reginald S. Attard—proposed that the grandmaster should formally serve as the Commander of the Castello to safeguard legal ownership of Torre Lanzun. The Grandmaster took over the jurisdiction on the 14th September 2001. The late grandmaster H.E. Don Carlos Gereda de Borbón, Marquis of Almazan assumed the post of Grand Commander on the 9th September 2009, with the current serving Commander being Chev Carmel Bonello.